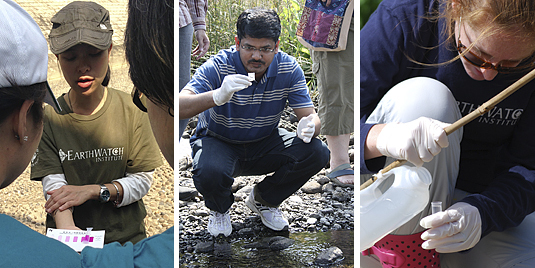 The FreshWater Watch programme has two main components: global research and local research. Here you will learn a little bit about these linked research activities. FreshWater Watch research is investigating the health of the world’s freshwater on a scale never seen before, collecting data from all over the world in very different locations. What these locations have in common is that the waterbodies are rarely monitored, yet are affected by changes in local land use and climate. We need information from different kinds of waterbodies to understand how each type reacts to pressures from population density, agricultural activity and land use. FreshWater Watchers can choose to monitor streams, small rivers, ponds, lakes, ditches, canals and wetlands. A typical FreshWater Watcher visits their water bodies at least four times per year, as most water bodies change throughout the seasons. The global collection of data is being used by scientists to determine trends in freshwater health, locating the areas of particular concern, and attempting to establish general statements of cause and effect. One hypothesis of the global research is that increased urbanisation across the world is having adverse effects on water quality and is changing the natural cycles and processes within freshwater ecosystems. Water is a global challenge but water issues are inherently local. So we have set up a network of freshwater experts around the world who have a strong interest in understanding and preserving their local waterbodies. There are a variety of local research projects that are ongoing and specific to the region and local water issues. While these projects contribute data for the global research, they also look at challenges to local water management, by answering specific research questions that are relevant in each location. These have made some substantial progress and in some places have influenced local policy. At this level of FreshWater Watch, we form partnerships with corporate partners as well as schools, NGOs and other groups to support our local research activities. Global research questions guiding FreshWater Watch studies. Take a look at our map to discover local projects near you. We want you! Find out how you can get involved.